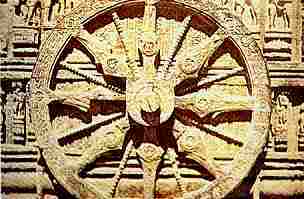 The 8-spoked wheel is the celestial cross overlaying the tertiary cross set to happen in 2012, galactic center. isn't there too much coincidence? ........ how can this all be propoganda? ..... The Nostrodomus paintings came out of the Vatican which makes me question the motive. The lost book of Nostradamus was found in the Vatican library, the last seven pages dealt with the end times and the astrological date of the day this age will end, 12-21-2012 the day the sun will align with the center of the universe, an event that is said to occur only once in 13,000 years. It showed the Antichrist would be a Muslim. Was Arabia ever part of the Roman Empire? Could there be any truth to these prophecies? The watermarked paper that these drawings were on dated from between the sixteenth and eighteenth centuries, and all of the ink except that which was on the last page dated before the eighteenth century, and that page was a testament from a Bishop attesting to the fact that this book was given by the son of Nostradamus. Drawings were in the style of the drawings in the Tarot cards that were growing in popularity in the sixteenth century. These drawings coincided with known written verse by Nostradamus. The prophecies began with Henry the 2nd of France, who was killed accidentally in a jousting tournament. And even included the twin towers burning on 911. Beginning with page 62 of this book the drawings showed war with Muslims against certain Popes and the Catholic church, leading up to Pope John Paul the 1st and John Paul the 2nd, including the currant pontiff ending with the next and final pope who appears to be the false profit working with the antichrist. History shows the truth of How John Paul the 1st served a very short time before he was poisoned, and how John Paul the 2nd was shot by a Turk who was a Muslim, this was depicted by a drawing of a pope wearing John Paul’s coat of arms and being attacked by a smaller Muslim with a sword. Castle del Monte in it's finest geometrical "angle"
Ciggy wrote: I have a theory on why it is they love dragon imagery so much. Please tell us your theory as to why so many secret societies, like the City of London Mercantile Conglomerate aka Dragon, use dragon symbolism. Ciggy, Your dragon theory makes a lot of sense. If someone revealed the dinosaur bones, one of the enlightened men could claim to have slayed the dragon, and the bones are the proof. Totally a win/win situation all around. Dove & Ciggy, you verified my suspicions about the Nostrodamus hubub. Right from the get go, it looks like the hero is a reptilian since he says, "I've been living under a rock." Jim Morrison talking about being the lizzard king. The reptile is the hero Oy Vay. Martial law and evacuation centers, no doubt about it. 18 underground Norwegian bases in case of a cosmic accident, no doubt.... Return of Archaic Man, RIGHT ON! .... Rain toxin to dumb down the population, fahgedaboudit, but have a gas mask in case. Our hero picking organic hallucinagins and the heat coming down is already happening. Holographic weaponry is a fact, jack. A caste society using mind control, just turn on your TV to find out.